Eight modern, flexible meeting rooms are available at the Kaiserhof. As a conference hotel in the city center of Muenster we offer a comprehensive service before, during and after your event. All conference rooms are equipped with modern equipment and are air conditioned. Wi-Fi is available throughout the house free of charge. Speakers have a particularly high priority for us and get plenty of free extras. Be inspired by our ideas for your next corporate party in Muenster. Our event team iscompetently taking care for your request. Attractive conference packages and appealing offers for celebrations are individually calculated to your needs. The friendly service team is at your side during the event, discusses the latest details and offers help and advice. 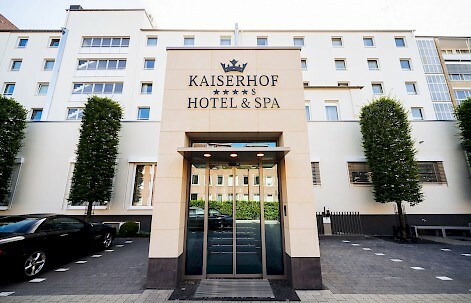 Participants of your business event in Muenster can easily get to the Hotel Kaiserhof. The main train and bus stations are only a few meters away. People arriving by car can park in the hotel car park with valet parking service. Even with the plane, we are easy to reach (FMO - Muenster / Osnabrueck Airport). Of course, our rooms can also be used for private events. Whether you plan a wedding, birthday or family celebration - the individual rooms are suitable for small and large parties up to 100 people. For more information, please visit our site "Celebrations".